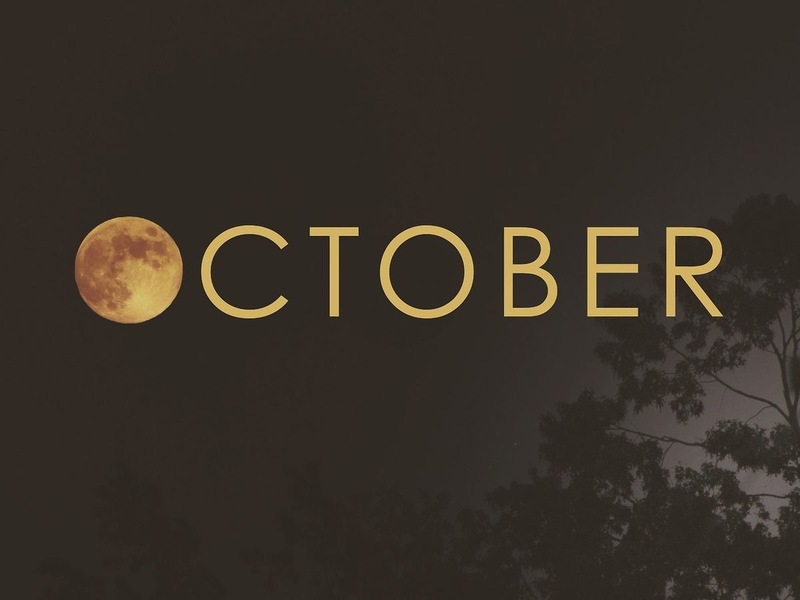 October has been an awesome month for us. We spent a couple of weeks on a New Mexico adventure, came home and worked on fall projects; Mom had a birthday and it’s going to be Halloween soon. The leaves are just starting to turn here in Oklahoma; we already know October is going to be our favorite color. We haven’t had a frost yet so some spring plants are still lingering. How very darling you are in your Autumn colors! Enjoy them for us please, since we have none! It was 98 degrees here yesterday! You two enjoy your darling costumes. 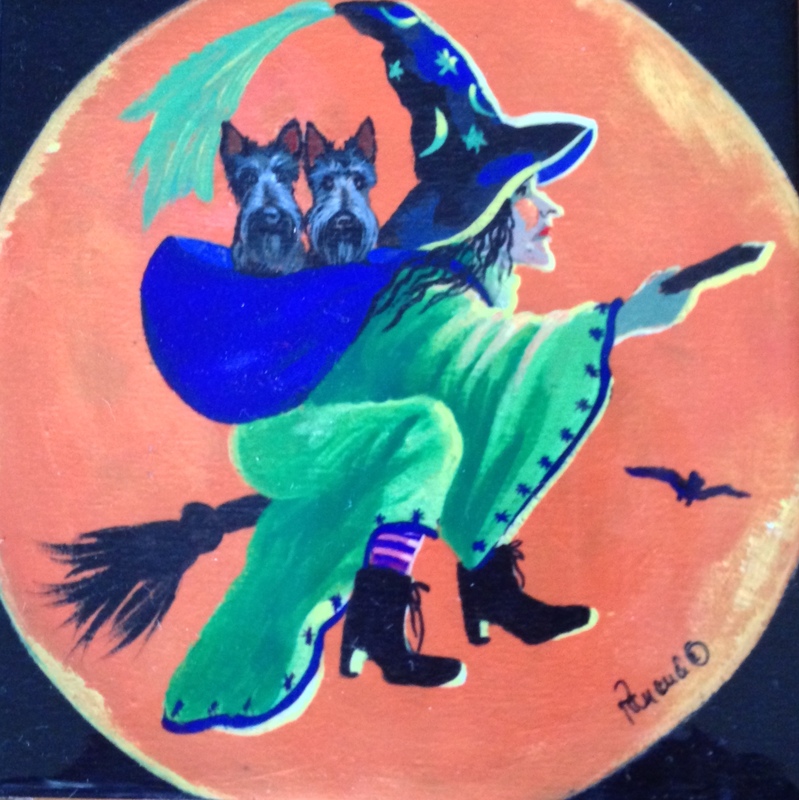 Who did that neat Witch’s Ride-along painting of you two?It really is good! Last night we did have a larger than usual “Harvest Moon”. 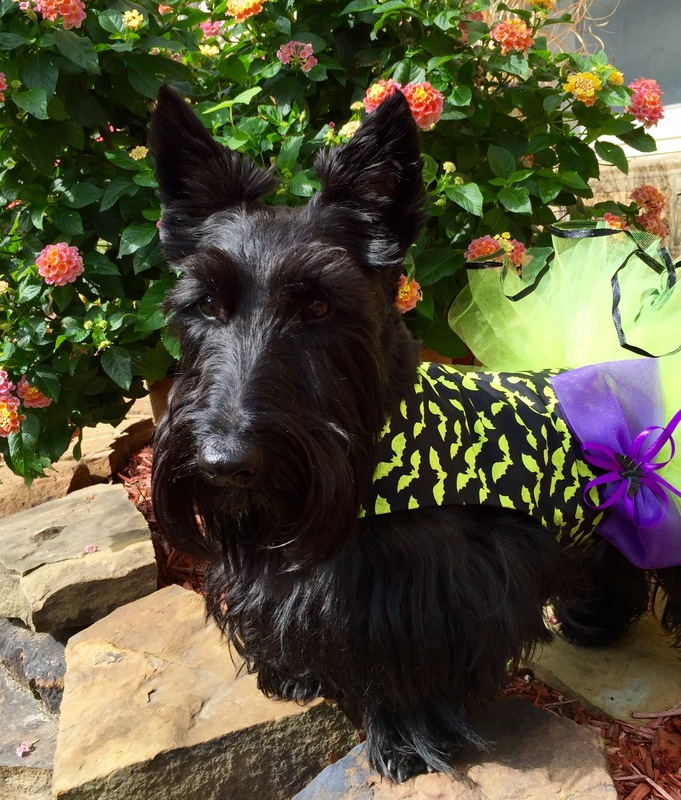 It was big enough to bring out the Aro-o-o-o in some Halloween Spooky Scotties! The witch painting is actually a tile. It is one of Mom’s favorites. There is a name on it but not clear as you can see in the picture. A wet Halloween is forecast for us. It’s just as well; we don’t like our doorbell ringing anyway. Mama and I are sorry to see October go too! We dislike Daylight Savings Time intensely, but we have Fala To The Rescue to look forward to next week…wish you two were bringing Mom & Dad. Now we’re gonna have to talk about ya….BOL! We don’t mind Daylight Savings. Mom likes it lighter in the morning. Mom said she wished FTTR was another time of year. It always happens when we just had a vacation. Next year we are planning a fall Door County. Perhaps in 2017 we’ll come your way. It’s a long trip for you all….Fala is a 9 hr drive for us…..Mama isn’t such a spring chicken anymore when it comes to long distance driving….. Mom thought it was a shorter distance for you. We had chili cheese coneys last night. We got the weenie part. Mom loves cornbread.